Living in a dorm room can really get you down if you don't do it right. You've just got to make your space (small as it may be) pretty and personalized. My dorm room has a nautical theme because, well, what better theme is there? 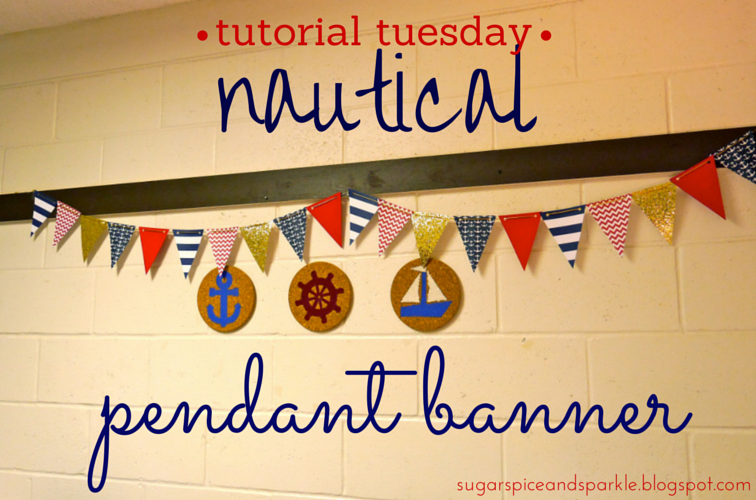 Check out this post for more details and nautical DIY projects. Today I added something new to my room and I think it is my best decoration yet! I am in love with it and it was so easy to make and I hope you love it too! 2 of my sheets were 8.5" by 11" and the others were 12" by 12". So first we'll deal with the 8.5" by 11" sheets. Fold it in half, as we used to say in kindergarten, "hamburger" style. If your paper has a pattern like mine, make sure that it will be in the right direction in the end. Sadly 2 ended up with upside down anchors, but there was really no preventing that so I decided to make 4 of each pattern moving forward. Now onto how to deal with the 12" by 12" sheets. But first let's admire this glorious Hobby Lobby find. A full sheet of glitter, I mean honestly, this makes me so happy! *Look away from the shiny object* Ok so anyways... You'll want to take one of your extra flags and use it as a template. The glitter paper is not exactly fold-able so this is the method you've gotta use. Just line it up with the edge best you can and trace around it. Since this paper isn't patterned, we'll be able to use all of the triangles. Next cut them out. Be prepared to have glitter everywhere. Just embrace it and wait until the very end to attempt clean-up. Next we need to punch the holes. I used some quick measurements to roughly mark holes on each flag, try to make them consistent but you don't have to be perfect with it. I'm seriously making that my phone screen, that is a pile of joy right there I tell you! Glitter, anchors, and chevron - oh my! So after you lay them out in order just string them up! I made it so the gold string was in the front of each pendant, if that makes sense, because I wanted to be able to see it. If your string is less than stellar you may want to string them in such a way that it won't really be visible. Totally up to you! Then hang them and admire your work! That's the best part! If you want to see how I made those cork boards, click here! And here! Please please PLEASE share yours with me if you make one! Tag @sugarspiceandsparkle on Instagram! I would love to see your results! Thanks for reading and let me know in the comments if you have any ideas for next week's Tutorial Tuesday. Visit Sugar Spice and Sparkle's profile on Pinterest.